It extending their unbeaten run to seven league games, including four wins from the last five. Rovers started the brighter of the two sides, with a couple of half-chances, but it was visitors Uxbridge who gave the first test to either keeper when Walnut Boys keeper Martin Conway blocked a goal-bound effort with an outstretched right leg. Kempston had to make a substitution just before the half-hour mark when Shane Bush suffered a nasty-looking clash of heads with an opponent. He was stretchered off the field and treated in the dressing room before being taken to hospital at half-time. Bush was replaced by Jake Newman, who made an immediate impact. A long Grant Fryer ball was contested by Newman who battled well to win the ball off a defender to give himself a shooting opportunity, which he duly dispatched low and across the keeper into the far corner. Kempston continued to press as the break approached, with chances created for Jamaine Ivy, Fryer and Newman. Uxbridge got themselves back in the game deep into first-half added time when forward David Manul managed to bustle his way into the area and tangled with Conway. 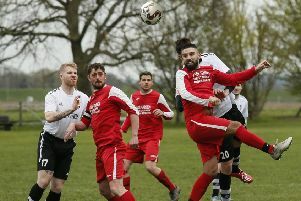 Despite coming off worse in the challenge, the referee penalised the keeper and awarded the penalty, which was converted by veteran striker Anthony Thomas. Rovers dominated the second period and created several early chances, but it took until the 55th minute to regain the lead. A Luke Heneghan cross found its way to Sam Johnson, who found space to put the ball back across the goal. After an almighty scramble it was Ivy who tapped home his seventh goal of the season and 30th overall in Rovers colours. Kempston pressed forward to get a third goal and make the game safe, showing some neat interplay down the right. The extra goal was not needed on this occasion as the visitors only managed one further effort on target which was comfortably saved by Conway. Rovers: Conway, Sundire, Lyon, Goodman, Simpson, Fryer, Heneghan, Macrae, Ivy, Bush, Johnson.